I'll admit that cutting tees into long strips is a tedious task, but, amazingly, it's satisfying at the same time. It makes me feel all industrious like the Utah pioneers who used their old bedding for clothing, then when the clothes wore out they turned them into rags.... then when the rags wore out they turned them into rugs... and when the rugs wore out they burned them and made soap from the ashes. Crazy huh?! I'm not nearly that conservative or hardworking, but I think we could all benefit from doing just a little bit more of "re-using" stuff instead of throwing it away. So, for the sake of the planet and my wallet, I'm turning all these old tees into a rug for my kitchen (stay tuned for the pattern). I don't think I could ever throw one away again! Check out this tutorial HERE to learn how to make your own t-shirt yarn. I love this idea! I have been crocheting up a storm lately (I haven't done it in years but for some reason, now that I've restarted I can't stop) so this sounds like a perfect project. I also love the idea of reusing things! Plus who doesn't have a drawer full of old shirts and giveaway shirts that you never really wanted. Thanks for the advice on not using shirts with print, most of mine have just a little bit on the top so I think I can cut that away. Thanks for the inspiration! ahhh you are so clever!!!! and even better - you can throw the rug in the washing machine to clean ! I have yet to do this -- thanks for the inspiration! Awesome way to recycle and decorate! I love this idea!! I will never throw out an old t-shirt ever again! Hi Elise, I love that you are doing this, and the fact is the yarn that you are creating from these old tee shirts, is very good quality. It washes wonderfully and is very comfortable under your feet. Great for table place matts, too. You asked about my aprons, whether I used patterns or made my own. The truth is I make my aprons from old dresses, shirts and jeans. I let the first item be the foundation for the finished product and just get creative with it. This is one of my going green tricks. Thanks for visiting my blog. I love your blog and appreciate your friendship. 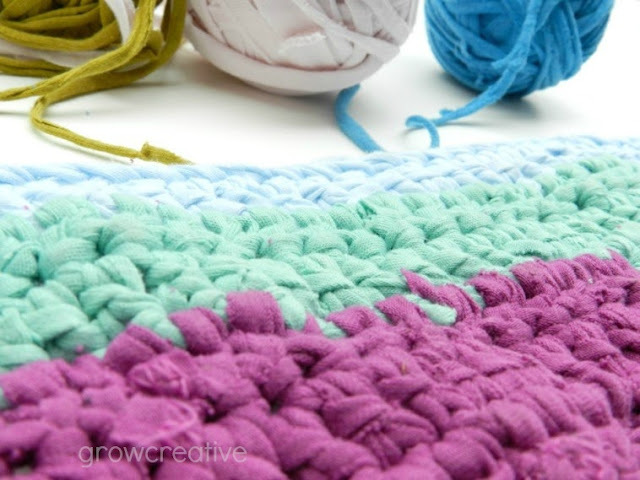 I just love the colors of tees you chose for this project and the rug is absolutely fab! You are industrious. It looks like the rug will be worth the effort. Love the colors. You have so many creative ideas on your blog. I love the idea of using the yarn as a rug! I make t-shirt yarn, too, but I mostly make jewelry with it. It's super soft!